Flappy bird is a very simple idea that is easy to implement. A simple game, ideal for beginners. Hidden object games are ever so popular, and very easy to make using WADE's integrated hidden object tool. Learn how to use it with this video. In most story-driven games there are cutscenes with characters talking to each other. Really easy to do with WADE, watch this video for the details. We all love old-school top-down shooters. Get started with WADE and the visual editor. Create a simple Hello World application. Add images and files from your hard drive or the internet into the project. Make your object come to life by adding some animations. Learn about WADE's event system, and how to tell WADE what to do when something happens. A timeline is a series of events that happen at predefined moments in time. There's an intuitive editor for it in WADE. When using WADE you are watching a scene through a camera. Learn how to control the camera. How to set objects to move on predefined paths and animate their property such as opacity and size with several interpolation (tweening) methods. WADE has a layering system, similar to he ones you'd find in image processing applications. WADE supports a powerful entity-component system. Learn how to create reusable and customisable bits of code for your projects. The best thing about HTML5 games is that they are so portable, running on a wide variety of devices. But how do you design a game that works on just about any screen size and aspect ratio? Click here and you'll find out. Collision detection is a fundamental aspect of many games. WADE does the difficult bit for you, and here we show you how to make the most of it in your own games. 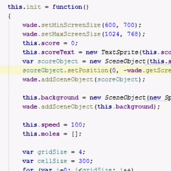 You can easily assign custom properties to your scene objects and sprites. Games and apps are so much better when they have some audio and music. Learn how to do that with WADE. Learn to use shaders in WADE to create special effects. In this tutorial we create some basic water. Debugging might be tedious, but sometimes it's necessary if you want to know why your game isn't working as intended. Luckily, it's quite easy to debug a WADE game. Templates are special objects that are mainly used to create clones, or as markers in level design. WADE's physics is a wrapper built on top of the popular Box2D engine. So you have made a nice game or app, and now you want to turn it into a native Android app with its own APK? You can do just that with the Android plug-in for WADE. How do you work with multiple scenes? Can you transfer objects from one scene to the next? Of course you can - watch this video to learn how. Did you know you could extend the functionality of the WADE IDE by including your own (or someone else's) scripts? This video will show you how to do that. Set everything up and create a first version of a whack-a-mole through scripts, without using the visual editor. Let's create a Mole behavior using WADE's entity-component-system.